Although his regular season scoring exploits earned him great acclaim during his twelve NHL seasons, Jacques Lemaire's post-season heroics made the season stats pale in comparison. In Game 7 of the 1971 Stanley Cup final, Chicago was leading 2-0 when Lemaire's slapshot from centre ice beat Hawks' netminder Tony Esposito to precipitate a comeback that saw Montreal stun Chicago 3-2 to win the Stanley Cup. Jacques dramatically concluded the Boston Bruins' season on May 14, 1977 with the overtime winner at 4:32 in Game 4. But the goal Jacques Lemaire remembers as his playing pinnacle goes back to his rookie season. On May 5, 1968, Montreal Canadiens faced the expansion St. Louis Blues in Game 1 of the Stanley Cup final. Montreal had finished the regular season with 94 points, capturing first place in the East Division, which was comprised by the 'Original 67' squads. St. Louis had eked out a third-place finish on the expansion side, gaining 70 points in the West Division. It was almost as though Montreal was taking on the 'Canadiens lite.' Among the Blues who had spent time in the Montreal organization were 'Red' Berenson, Doug Harvey, Bill McCreary, Dickie Moore, Noel Picard, Barclay Plager, Jacques Plante, Jimmy Roberts and Jean-Guy Talbot, as well as coach Scotty Bowman and scout Cliff Fletcher. After eliminating Chicago in five games, Montreal was able to rest, awaiting their Stanley Cup foe. St. Louis, meanwhile, had edged Minnesota after a hard-fought semi-final. St. Louis surprised Montreal in Game 1 of the Stanley Cup final on May 5, 1968. At the end of regulation, the score was knotted at two. "When we returned to the ice to start the overtime period, Toe (Blake) tapped me on the shoulder to tell me I was on the ice next," recalled Lemaire. "I was alert enough to follow the play from the bench and jump right into the flow the second my skates hit the ice. I took a pass at their blueline, let the shot go, and all of a sudden, the goal light went on behind Glenn Hall. My teammates huddled all around me, patting me on the head." Jacques Lemaire had scored an unassisted goal at 1:41 of the first overtime to win the game for the Canadiens. It was the second overtime goal of the playoffs for the young centre, an NHL record for rookies. The Canadiens proceeded to defeat St. Louis in four consecutive games, earning Lemaire his first Stanley Cup championship. But the series was a tougher battle than it appeared. Each game was won by a single goal and two, including Lemaire's winner, were decided in overtime. In fact, at the conclusion of the final game, the Conn Smythe Trophy was awarded to losing netminder, Glenn Hall. 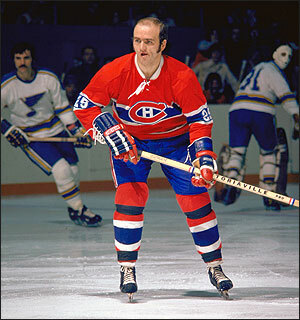 It was the first of eight Stanley Cup wins for Jacques Lemaire over his sensational twelve-season career. And teammates are quick to point out that it is no coincidence that the dynasty that won four straight Stanley Cup championships in the late 1970's concluded and coincided with the retirement of Jacques Lemaire in 1979.